Effectively defining, allocating and managing risk is essential not only for avoiding costly disputes but for the smooth transition between different project phases. As many projects move from construction to O&M, parties are recognising that gaps and unfair risk distribution may appear in contracts. 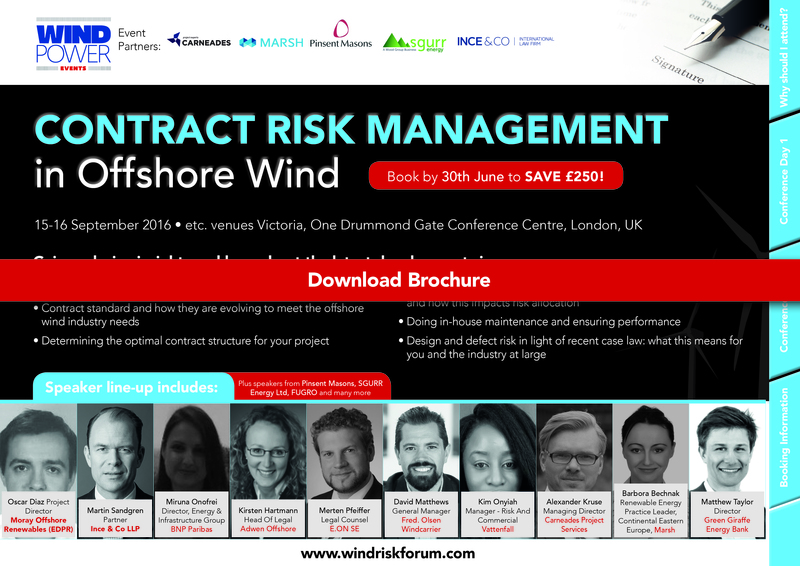 Now in its fourth year, Windpower Monthly’s Contract Risk Management in Offshore Wind will provide you with practical tools and proactive strategies to help manage these risks within the complex contracting environment of offshore wind. This is the only forum dedicated to this critical function. Contractor and developer views on definitions and risk measures – what steps can both sides take to save time and money when negotiating? Risk changes and evolves throughout a project lifecycle. Don’t miss this opportunity to learn from leading experts in this area and better understand how you can manage contract risk and avoid potentially crippling delays and disputes in your projects. "The conference gave me new valuable insights in contract risk management issues." "The key to success lies in innovation, controlling risk and lowering costs in the long term. This forum is of great value to the offshore wind industry as it combines these different perspectives and connects them with key players to share, learn and advance." “Offshore wind projects are large and complex. They offer great potential for failure, cost overruns and delay but also a great business opportunity if managed properly! The right contracting strategy is key for success."